All tours require a moderate amount of physical exertion. On the pattern plus tour and extreme tour, you should be able to climb normal stairs in two different 65 ft towers, and a 100 ft tower, and walk a short distance on unpaved trails and have average balance capabilities. Each participant must be physically able to control the speed of their travel along the zip lines by grasping the cable with leather gloves. Participants must also be able to pull themselves along the zip cable several feet in the event they lose their momentum before reaching any given platform. You must have a full range of motion and use of both of your upper and lower extremities. You must be able to see and hear our guides and recognize hand motions. Please feel free to call us if you are not sure. This is not recommended for those with moderate to severe respiratory problems, heart problems, severe to moderate musculoskeletal problems, back problems or those who are in their mid to last trimester of pregnancy. We do not do tandem rides at all. No, we do not let pets on the zip line canopy tour! We do require that at least two participants are on any of our aerial adventures. Please check adventure levels and options for weight requirements. ** Please note and understand that our staff and management have the right to refuse anyone participation rights if they do not meet the above requirements or if it is deemed unsafe for them or anyone else in the group. The staff has the final say on participation. Do NOT wear sandals, flip flops or open toed shoes or shoes with no backs of any kind! No No No: five-fingered shoes are allowed. We can’t let you on the tour if you do not wear the appropriate shoes! You will not be allowed to go on the course and there is no refund for not having the right shoes on! You may wear shorts but short shorts are not recommended due to the gear you will need to put on. If you have anything loose, leave it in your room or vehicle or have a zip or velcro type pocket or “fanny pac”. If you bring a camera, make sure it has a wrist or neck strap attached. If you lose something at 200 ft in the air, you are most likely not going to get it back! We are here most every day and welcome you to contact us at 770-834-9149 or send an email when you are ready to plan your weekend getaway, group event, family adventure vacation or corporate retreat. We are open year round! To ensure a quality experience, tours are offered by reservation only. 1. For those guests who fail to show for a reservation or cancel the day of, no refunds will be issued. 2 If you must cancel with less than the 7 days notice for individuals or 14 days for groups, the reservation will keep a 50% charge plus a $20.00 processing fee with the balance refunded to the card used to reserve the times. 3. If you cancel outside of the cancellation policy, a full refund minus a $20.00 processiing fee will be given to the card used to make the reservation. For Groups, it will be the person’s responsibility, who made the reservation, to have their group members reimburse them for any reservation or cancellation fees charged. If you are making the reservation, we will charge the group coordinator’s card for the full amount of the guests you schedule. Groups Must Make ONE payment. We do take cash and credit cards (Mastercard, Visa, and Discover) only as payment- NO personal CHECKS. If you want to pay cash for a reservation, the reservation must be prepaid and a credit card is still required to be on file to cover upgrades of tours that have not been prepaid. A guest can pay cash at check out for upgrades but if the guest does not come back to pay, the card will be used for any and all upgrades done. We will not run tours in thunderstorms, high winds, or “close in” lightning (3 miles). It is important to remember that foul weather in your area does not necessarily mean foul weather at Banning Mills. Please call first if you have concerns about the weather. We will call only if we are certain your tour will not run. In some cases, tours may be postponed to allow for some weather systems to pass. Sometimes tours might end up being on hold from 45 to 60 minutes due to weather pop-ups. When you are planning a tour with us, please take this into consideration. If we do not call you, the tour is still ” a go”. If you do not show up, that will be considered a no show and the cancellation policy will kick in. Please be at Banning Mills at least 30 minutes before your scheduled event. We do try to leave as promptly as possible and if you are very late, you may miss your tour time. We cannot guarantee you a place on the next tour. If you miss your tour time, there will be no refund given. Please understand that we DO NOT guarantee that you will go out promptly at your scheduled time. We have no control over weather pop- ups or how any guest will react to the course. Some guests will take longer than others and so extend the estimated course time that they are out. Make sure you TAKE THIS into consideration as you plan your tour with us. Please be patient, especially with others in your group, because you are going to be glad you did! ARE YOU READY?!! All tour times are estimates. Times may be shorter or longer depending on the number on the tour, physical abilities, and fear factor. 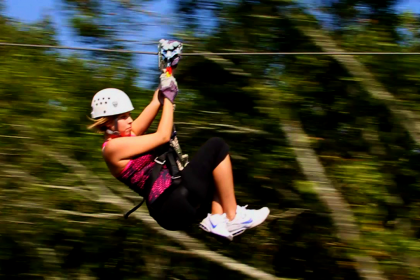 Tour times do include gear up and safety briefings, as well as your zip lines and tree, walks per tour chosen. We are open all year except Thanksgiving Day, Christmas and New Year’s Day. We also have great accommodations here in a number of price ranges!! Sooo don’t worry about a place to stay. We take cash, Visa, Master card and Discover as payments. We no longer take American Express cards. Please understand that your card will be charged at the time of the reservation. Cancellations outside the cancellation policy will get a full refund minus a $20.00 processing fee. Cancellations within the 7 to 14 days will have the 50% charge plus the $20.00 processing fee with the balance refunded to the card used to make the reservation. No refunds on “day of” cancellations and no-show guests. Banning Mills is a non-profit conservancy center. Proceeds of the zip line canopy tours are used to help subsidize our educational, leadership and conservancy programs. Because of budget constraints, these tours will keep our outdoor education experiences affordable to schools and youth organizations. We are here almost every day and welcome you to contact us at 770-834-9149 or send an email when you are ready to plan your weekend getaway, group event, family adventure vacation or corporate retreat. Historic Banning Mills is a non-profit retreat and conservation center. Banning Mills is a non-smoking facility!